This Sunday, 4th September, will see the 56th year of Offshore Powerboat Racing at Cowes. 15 boats have signed up tackle the legendary Cowes Torquay Cowes, while an impressive entry of 20 will take on the Cowes Pooole Cowes race. The main focus of the Event will obviously be on UIM Marathon Class A, in which five 100 mph plus craft have entered. Last year’s winner Vector Martini Rosso, crewed this year by Peter Dredge, Simon Powell, Mal Crease and Jason McVicar from Canada, will have a tough time defending the Beaverbrook Trophy against stiff opposition. Richard Carr, Steve Curtis and Paul Sinclair have resurrected a vintage aluminium Cougar mono hull and powered it with two 1350 Mercury Racing engines. After an eight year sabbatical, Car makes his return to Offshore Racing at Cowes. Curtis, has won the UIM Class 1 World Championship a record eight times, although a Cowes Torquay Cowes win has eluded him thus far. Maurizio Schepici and Gabriele Giambattista (top Picture) from Italy made their debut at this race last year only for mechanical failure before Torquay robbed them of hunting down Vector Martini. The duo will once again be driving the Seatek powered Metamarine hull, Tommy Racing Team. Miles Jennings with Markus and Vincent Hendricks from Germany have made plenty of changes to their Mercury Racing powered Hendricks 55 set-up. 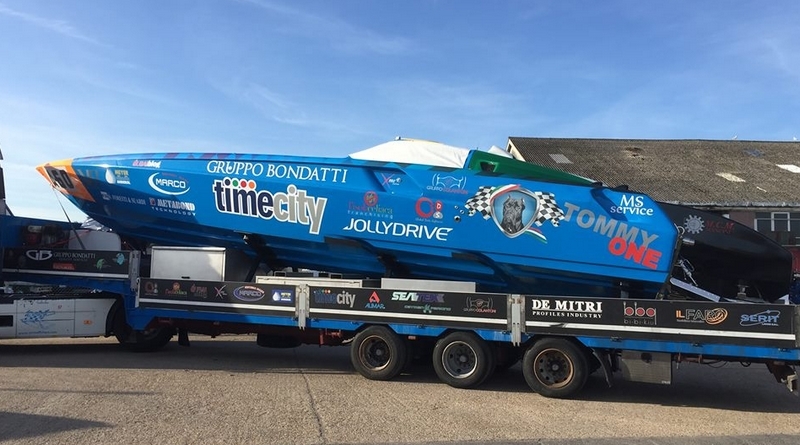 The 50′ beast was seen running at speeds well in excess of 100 mph in testing this week and with a force 4-5 wind predicted on Sunday, two times Cowes Torquay winner Markus Hendricks will revel throttling her in the rougher sections of the course. Drew Langdon has paired with Italian Giancarlo Cangiano in a Mercury Racing powered Outerlimits hull – Silverline. Their testing in the West Country has gone according to plan and the American built hull has been knocking on the door of 120 mph. At 08:45 on Sunday morning the racing fleet will muster to the east of the Cowes Harbour entrance. The boats will then pass at speed in a convoy past the Snowden sailing mark before starting the actual race immediately to the north of Gurnard North Cardinal Buoy at 09:30. The Cowes – Poole – Cowes race will commence 15 minutes later at 09.45.